Union Club Tacoma will be periodically sending emails to our community highlighting the achievements and projects of our members. We are excited to introduce our community to the Monarch Butterfly Flight Challenge. For the past few years, Eli Moreno of Union Club and SURGETacoma has served on the Board of Directors of the Monarch Butterfly Fund, and he wanted to share with us an exciting new project. In recent years we have witnessed the decline of Monarchs reaching the overwinter sites in Mexico from Canada and the United States, and we have very little information about their flight patterns or what they need to survive on their long yearly migrations over several thousand miles. That’s where you come in. 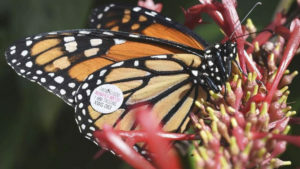 He is launching a challenge to the public and we need your help to incentivize designers engineers and science enthusiast to design and create a new, technologically-advance tagging and tracking system for Monarch butterflies. We will award $50,000 to whoever can create the first prototype. Eli and his wife Amber are putting half of the prize money and with your help we can help scientists gain valuable information about the Monarch’s extraordinary migration before is too late. Read the Tacoma Tribune article on the challenge here.